to strengthen the merit of Electric injection molding machine. 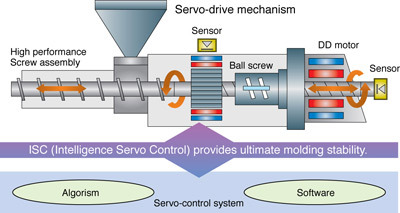 Sumitomo is the first company of the injection moulding machine whose machine equipped with Direct Drive. To develop the Direct Drive for injection use, Plastic machinery Division corporate with the leading company of Drive Technology, Sumitomo Heavy Industries Ltd, Power Trans mission Control Division. Top injection molding machine technologies harmonized with top Drive Technologies. 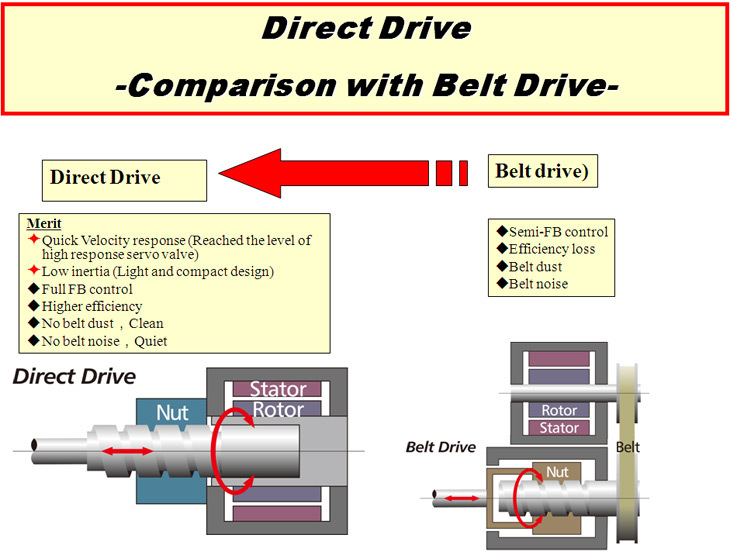 This diagram shows　the compact, low-inertia, direct-drive configuration of the SE-DUZ injection unit. The motor for injection uses a load cell to provide feedback that dictates the speed and torque required for precision injection pressure. all functions for example Zero-molding, DCPP and so on.